Film Noir Archive finds director Michael Mann established his archetypal lead character in his debut film Thief. A Shroud of Thoughts gives a detailed overview of one of the most popular British TV series of the 1960s, The Saint. Destroy All Fanboys enjoys the light tone of Jules Dassin’s caper film Topkapi. Realweegiemidget Reviews was charmed by the Scottish film The Angels’ Share, about a group serving community payback who decide to steal some rare whiskey. Liz Durano pays tribute to The Usual Suspects‘ ensemble cast and great twist ending. Sometimes They Go to Eleven reviews one of the classic “thieves fall out” films, 1968’s The Split. Love Letters to Old Hollywood contrasts and compares Dirty Rotten Scoundrels to the film it was based on, the rarely-seen Bedtime Story. LA Explorer delights in the twists and turns in the plot of the Cary Grant/Audrey Hepburn film, Charade. The Midnite Drive-In is not that surprised to discover the two early films versions of The Maltese Falcon can’t compare to the John Huston/Humphrey Bogart classic. Please join us tomorrow for Day 3! Hi Debbie. 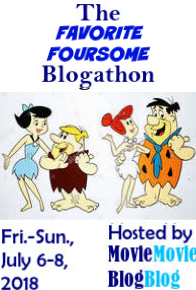 My entry for the blogathon is going to be one or two days late unfortunately. I’ve definitely started on it, but I’ve got a headache, so can’t complete it tonight. Just wanted to let you know. No problem! Feel better soon.